The Ancona Aero Island IV range hood will add style and elegance to your kitchen. Made from highly resistant 430 stainless steel, this island range hood offers four finished sides with sleek lines, smooth performance and energy efficient LED lighting. The Aero Island range hood is quiet and offers continuous air renewal by effectively removing fumes and cooking greases. It features easy to use 3-speed electronic controls with convenient delayed auto shut off function and dishwasher-safe thin baffle filters. Available in 36 in. This GE 36" Wall-Mount Pyramid Chimney Hood in Stainless Steel has external or recirculating venting capabilities. 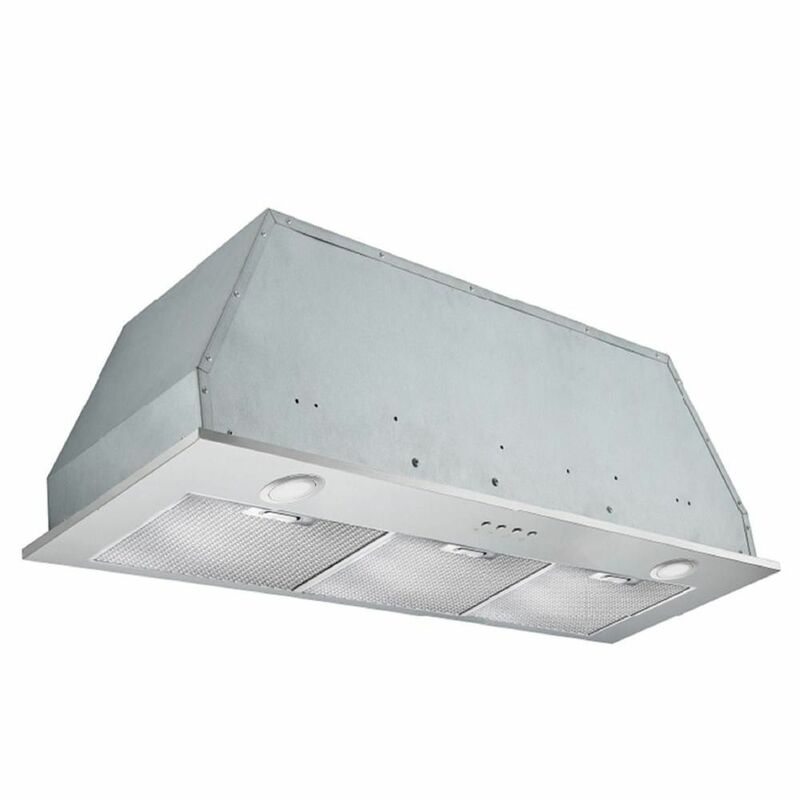 This hood will effectively remove smoke, grease, odour, and moisture. Dishwasher-safe filters allow effortless cleaning. Sporting a bold, dramatic look and state of the art features, this collection provides the perfect combination of style and innovation throughout your kitchen. The 30-inch GE range hood offers the technology home chefs expect to assist in preparing great meals for family and friends. The four-speed, 350 CFM fan promptly removes steam, smoke and odours from the air, while the dual halogen lighting with night-light option illuminates the cooking surface. Inserta Plus 36 inch Built-In Range Hood in Stainless Steel When your own kitchen cabinet design is where you want the focus, the Inserta Plus built-in is the range hood to choose. Made from the high quality 430 stainless steel, the Inserta Plus features 3-speed electronic controls with convenient auto shut-off function, long lasting, high output LED lights that are an eco-friendly way to brighten your cooking surface and aluminum mesh filters with stainless steel decorative panel that will maintain their luster even after many washes keeping your range hood looking as beautiful as the day you bought it. The Inserta Plus combines quiet and powerful ventilation with a sleek design that blends perfectly with every kitchen design. It is ready to fit today's modern lifestyle. Inserta Plus 36 inch Built-In Range Hood in Stainless Steel is rated 3.1 out of 5 by 35. Rated 4 out of 5 by Chicshacks from Good power and nice lighting We have had this fan installed now for one month. I like the varying speeds of the fan and the lighting is good although it would be nice if it too had a few brightness options. The sound on low is tolerable and on high is pretty loud but it is effective and we have a stove that gets cooked on a lot and we needed good ventilation. Installation is fairly easy, two man job to lift it into place but otherwise quite straight forward. Rated 1 out of 5 by evelyne from too loud Very, very loud on high but that would be ok if the low setting was quiet. but it is too loud even on low. i had to return it. too bad because the price and look were nice. Rated 4 out of 5 by DHart from easy to install I bought this just over a month ago, was easy to install, it is a little loud on high but not too bad, didn't really care for the lights that came with the unit. I like the overall finish with it set up in the cupboard. Rated 5 out of 5 by Kgurl from Excellent product Powerful enough that all you need to use is the lowest setting with tolerable noise level. Clean and sleek design, installation requires patience, but well worth it. Rated 3 out of 5 by Len Bond from Looks great, but very noisy. Very noisy. Looks good and works Ok, but so much noise. Rated 1 out of 5 by kdcanada from Very loud fan It looks good (slim profile) but is very loud. Loud even at the lowest setting. I do not use the highest setting because I am not able to have a conversation with the fan going. Rated 1 out of 5 by DIYExpert from NOT CONVERTIBLE. Extremely misleading. The unit clearly says "Convertible" in the name, so we bou... NOT CONVERTIBLE. Extremely misleading. The unit clearly says "Convertible" in the name, so we bought it thinking it was - you guessed it - convertible. We didn't think we would need to read the Q&A to see if it was actually convertible. The answer is NO. It cannot be used as a ductless range hood. Now we're too close to finishing the house up to change it out and the cabinets are already built to spec so we get to cut a hole in the side of our house and fish a duct through 10 feet away and try to retrofit a duct on our house. Thanks for the misleading title!